Not my style, but very pretty cards. Been trying to decide whether or not to get into water color. Very pretty! Looks like christmas lights in fog. I enjoyed your video, your cards are lovely. Good use for dies too! Sandy, these cards are beautiful! I love watching ypur videp tutorials, learm a lot from you 🙂 Thank You so much! It’s so much fun watching your videos, all the thought and talent that goes into each piece! Great idea! Love the results! Beautiful! I love watching the water hit the pencil and the vibrancy of the color. Thank you for sharing in a video. Great technique! Love your cards! I love this tutorial. Such a gorgeous card! Beautiful and very cool results! Watercolor has always scared me. These are beautiful! Wow. Both beautiful cards and the second one is my fave of the two. 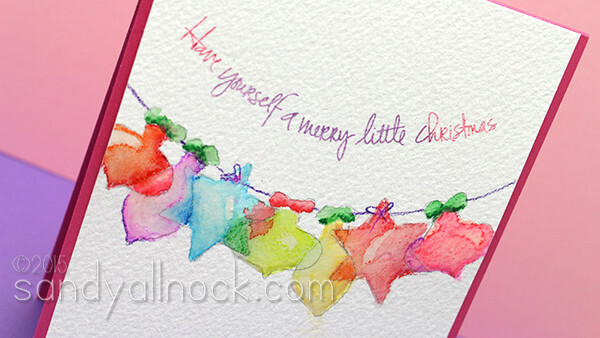 Oh Sandy, I love the delicate blending on the ornaments done with soft watercolor. You are the expert. Thank you for sharing your talent. Oh my gosh! This is so pretty and so something I would do. I have to try this! I’m going to watch your video because I want to see how you did this. I don’t have a die cutting machine but I have stencils and stamps I could do this with and I want to try it. Thanks for doing a video so I can see it. Such interesting water color, Sandy! Great Release! Thanks! These cards are awesome! I’m trying to learn about the possibilities that watercolors offer. Love the transparency effect! Isn’t it wonderful to find a new technique that looks so wonderful. Love the way the colors blend. Have to try this. I hope to be as brave as Sandy one day, my daily mantra. I got to leave my comfort soon. I have a little from all of your daily inspiration. I have been watching your videos and Periscope channel lately and I love everything I’ve seen. This video is not the exception. So pretty and creative… I love it!!! So sweet, whimsical and yet CAS elegant! Thank you for your wonderful painting tutorials Sandy!!! Beautiful! I enjoy seeing what you make. Gorgeous cards! Can’t wait to try this technique. What pencil did you use to outline the shapes? Was it in one of the sets you listed? Thanks. Cool technique. Thanks for the giveaway. I loved seeing the transformation of pencil mark texture into creamy lovely goodness! Also enjoyed the use of negative space from the dies! Water colors are my favorite, wish mine looked as good as yours!!! Love the coloring! Thanks for the video. Wow, your cards put a smile on my face with such happy colours! Beautiful cards. Great colors for holiday cards. Wow – so pretty! Haven’t used colored pencils since geography in high school – so fun to create something like what you’ve done. Thanks for sharing! Sandy your cards are so beautiful! I love the watercolor efect! The softness of those cards are so beautiful, love the look! Pretty. Don’t you just love to watercolor. Love all the colors mixing. Beautiful. Thanks. Your cards turned out beautiful, great watercoloring. What an absolutely beautiful and breathtaking effect. Thanks so much! 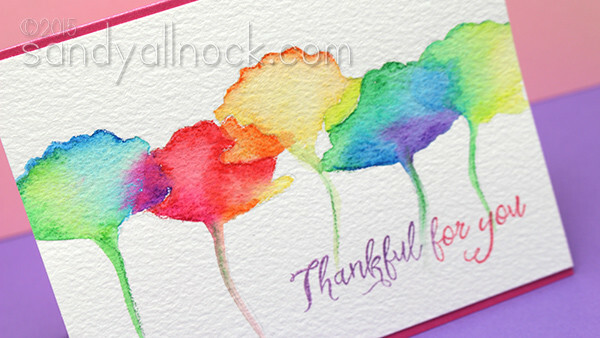 LOve the watercolor flowers! Beautiful! Will try this technique soon!